ARLINGTON—For the seventh year, North Texans will join in taking action for clean air and log commitments at www.airnorthtexas.org. Clean Air Action Day, the first Friday of summer every year, celebrates how North Texans can help improve air quality. Across the region June 24, North Texans will do something extra to reduce ozone-causing pollution. This year’s theme is “Lend a Hand to Help Improve Air Quality,” and with 18 potential clean air choices, there are several actions Texans can take to do their part to help the region. North Texans can learn about these steps by participating in a Transportation and Air Quality Workshop sponsored by Air North Texas. The Texas Department of Transportation, Texas A&M Transportation Institute, and the cities of Dallas and Cedar Hill will present about how electric and alternative fuel fleets, bicycle planning and other strategies reduce emissions. Participants can watch the workshop live and ask questions remotely beginning at 11:30 am on June 24. Visit www.airnorthtexas.org/CAADworkshop.asp to access the livestream or view the agenda. Bicycling, walking or driving an alternative fuel vehicle are just three of the ways to lend a hand and participate in Clean Air Action Day. Carpooling; riding mass transit; bicycling; walking; calling for a low-emitting taxi or limousine; using vehicle-approved biofuels; choosing a clean vehicle option if purchasing a new vehicle. Combining trips; avoiding idling; maintaining consistent driving speed by avoiding quick accelerations and hard braking. Pursuing energy efficient home improvements; switching to energy efficient light bulbs; using an electric, hand or alternative fuel lawnmower; confirming vehicle emissions and safety inspection is current; ensuring regular vehicle maintenance such as tire pressure checks and oil and filter changes are up to date. Buying local or in more walkable areas where less driving is required; choosing entertainment and dining in areas where less driving is required. Clean Air Action Day, established by the 34 Air North Texas partners, which include local governments, transportation partners and others, takes place at the height of ozone season to remind and energize North Texans to take action for clean air. This year the city of Dallas and its partners are hosting a Clean Air Action Day event on June 24 at City Hall Plaza and the J. Erik Jonsson Central Library to encourage city employees and residents to take action for clean air. Attendees can stop by between 10 am and 2 pm to learn about air quality, renewable energy and other topics relating to the environment, sustainability, and health and wellness. Activities will include a walk to the Dallas Farmers Market for lunch. 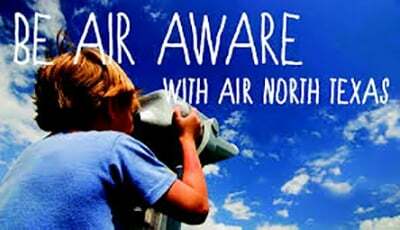 In addition to these initiatives and logging commitments at www.airnorthtexas.org, residents can enter the “Lend a Hand to Help Improve Air Quality” social media contest by writing their clean air action on their palm and sharing a photo of it with the hashtag #CAAD2016. Winners will receive a stuffed Arlo the Airmadillo, the Air North Texas mascot; more details are available online. Beyond June 24, Air North Texas partners are challenging individuals, businesses and local governments to commit to focused strategies on Ozone Action Days. Improving air quality is the responsibility of everyone, from the more than 7 million residents to the businesses employing them and the governments making decisions every day. Air quality impacts every North Texan, and the entire region must work together to continue to improve it. Meeting the federal air quality standard is important for the health and quality of life of residents. High ozone levels can make it more difficult to breathe deeply, cause shortness of breath and pain when taking a deep breath, or cause coughing and a sore or scratchy throat. Breathing ozone-polluted air also aggravates lung diseases such as asthma, emphysema and chronic bronchitis. Children, elderly and people with these conditions are more sensitive to ozone, but even healthy adults can be affected. The annual Clean Air Action Day is an opportunity for North Texans to do something extra to improve air quality and, in turn, help protect the health of North Texans and preserve the economic vitality of the region.